READY TO SELL: This beautiful home is the perfect entry into Moffat Beach. EVERYTHING old is new again ... what a difference a good idea and a good architect can make. 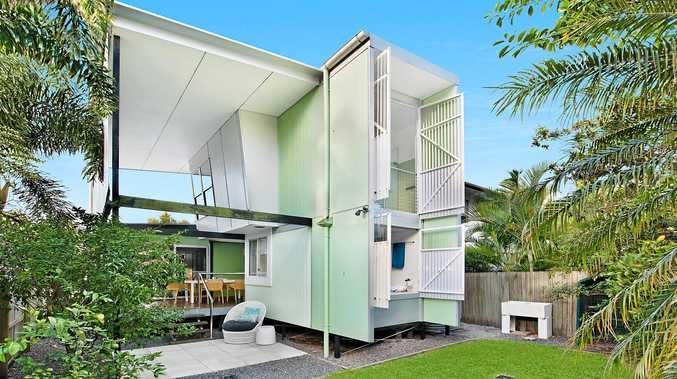 This 1950s beach house has been modernised without sacrificing its inherent charm. An architect-designed extension and renovation has shown what good planning can do. It has been given a professional retro look that has seen an initial investment repaying the owner in comfort as well as value over time. Located within walking distance to the cafes and surf. As such it captivates with a fusion of the indoor and outdoor living spaces, beautiful timber floors and first-class finishes. Architect Tim Bennetton reconfigured rooms and added a second level at the back that features a family bathroom and laundry, together with a main bedroom suite upstairs. The efforts were recognised in the 2014 Queensland Regional Architecture Awards: Sunshine　Coast. The exterior colour scheme is in a soft light green to reflect the era of the original house and the setting. Building up was considered better than building out as the 405sq m block is long and narrow. The living area was originally the carport at the front of the house. By creating a split level up to the kitchen it creates interest as well as softly defining the areas. The former living room has been transformed into a library/home office with built-in shelving ... floor-to-ceiling at one end and floating shelves along the length of the room. Tasmanian oak has been used for the benchtops in the kitchen while bold orange laminate highlights the cabinetry with soft-close drawers. There is the convenience of an integrated Blanco dishwasher, 900mm oven and gas cooktop. Like the kitchen, the guest bedroom opens to the central deck that acts as a breezeway but also a connection to the bedroom/bathroom extension while providing sheltered outdoor living. Step down from the deck to a patio and back lawn while the heavy timber decking continues into the bathroom, highlighting the beach holiday feel. The main bathroom/laundry features polycarbon barn doors as the southern wall. They blur the distinction between indoors and outside with its leafy backdrop. There is a concrete or quartz look to the tiling on the bath, good windows and separate toilet. The upstairs main bedroom is a highlight with its northern wall of glass allowing the room to bath in the warming winter sun while catching the cooling summer breezes. There is a north-facing Romeo balcony while a day bed or window seat has built-in storage and the double-hung windows are set at a slight angle to increase space and look down on the deck. The ensuite has the same polycarbon barn door effect for flow-through of air and natural light. 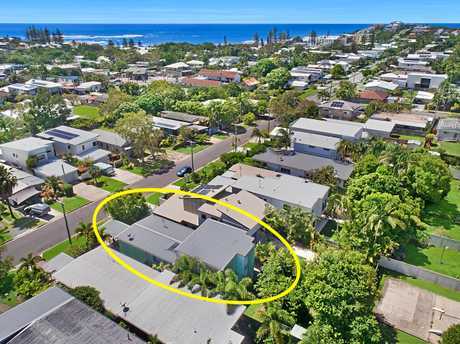 Located within walking distance to the cafes and surf, this beautiful home is an enticing entry into Moffat Beach. It has a new lease of life ... one that will take it into another generation for beach holidays or enjoy every day.